[CONFSERVER-17476] Flash content (and other embedded objects) overlaps menu content - Create and track feature requests for Atlassian products. 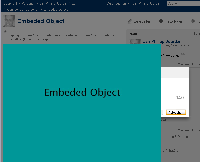 On pages with embedded objects eg. ppt, the object is displayed at the highest level of the page. The examples attached are captchured with rezising to a small window, but if for example using a navigation tree this issue is rased more often even using a high resolution.